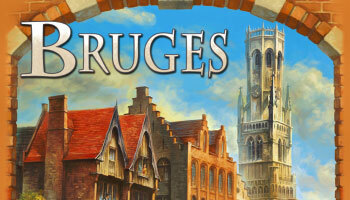 In Bruges, players take the role of 15th century merchants aiming for power and influence. 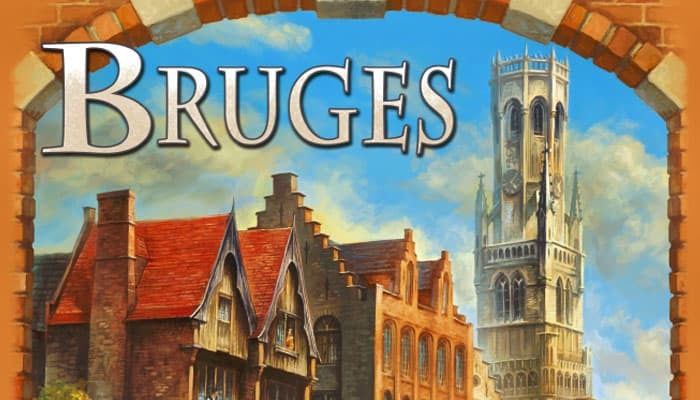 By balancing your resources, you can win over the influence of prominent persons like local merchants, bureaucrats, nobles, and other rules of the city. They are important to gain prestige, reputation and power. 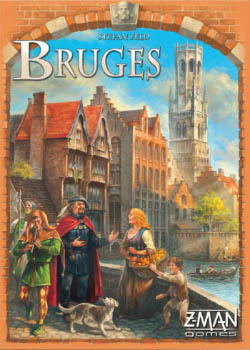 Each player use cards and money (guilders) to build houses, to recruit citizens and workers and to avoid threats such as floods and plagues. There are 165 character cards with 6 different actions avaliable: take workers, take money, avoid a threat, build a canal, build a house or hire the character on the card. The color of the card determines in which area the card can be used or the strength of the action. There are four different types of cards (Immediate action, Ongoing action, Activated action, Endgame bonus scoring) and the cost of the cards ranges between 0 and 12 florins. By completing one of the canals that encircle the city, you can gain reputation. Red – Loose one house or one canal section. Yellow – Loose all your florins to the bank. Blue – Loose your workers to the supply. Brown – Loose a person card from your display. Purple – Lose 3 VPs. When one of two decks of cards runs out, the game ends and the player with most victory points is the winner. 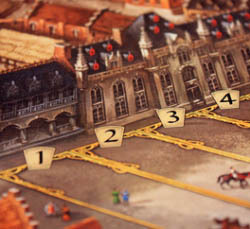 Players earn the victory points for people, houses, special abilities from people, majority markers they have flipped, canals and reputation. The game can be played by 2-4 players and an average game takes about 60 minutes. 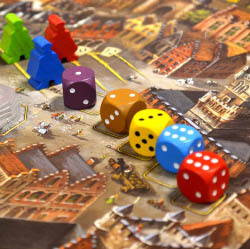 The board is placed in the middle of the table, so it is easily visible and accessible for all players. The 50/100er - tiles place next to the 49 space of the scoring track on the game board. The statue octagonal tiles are placed low to high face up on the statue space of the game board so that the tile with the 2 is at the bottom, then the 3 etc.